Dog Friendly Pubs in Ayrshire, Scotland. This friendly pub has remarkable walks nearby, a beautiful beer garden with view of the river. One of the most relaxing places in Scotland to be! Not only dog friendly, child friendly too! Fantastic food with a menu, fresh food cooked by order. Absolutely fantastic place! Dogs are welcome in the bar area to relax beside our open fire and also in our beer garden, fresh water and free treats. 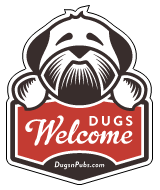 There are a total of 26 dog friendly listings in the Ayrshire Pubs category. Please log in, or sign up as a member to view all listings.